Kirkoswald is a short drive (about 6 miles) from junction 41 of the M6. The village is home to an interesting church with a separate bell tower on a hill high above, a beautiful ruined castle buried deep within a small wooded area, a fortified college and this site...a moated (probable) predecessor to Kirkoswald Castle. Above. 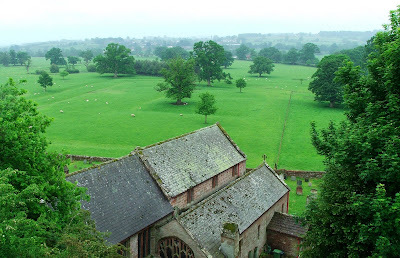 View of the moated site from the bell tower above the church. The moat can be found in a field to the South of the church of St Cuthbert, a largely 13th and 16th century church that still retains some 12th century masonry. The site consists of two ditches surrounding a small mound, some 50 metres by 20 metres, now with a large mature tree growing in its centre. A wooden tower is said to have been built here by Ralph Engaine, but I'm unable at this time, to find when this may have been. Above. View of the moated site from the churchyard. This site is thought to have been the precursor to the main castle of the village, a few hundred yards to the East. The moat can be seen from the church yard, although much better views can be had from the top of the hill where the church's bell tower stands. There does indeed seem to be some confusion as to what exactly this site represents. It's possible, from reading the biography of the site on the Gatehouse Gazetteer, that it may have been an early fortified vicarage, or as mentioned above, the precursor for Kirkoswald Castle. Hugh de Moreville, one of Thomas Beckett's assassins, was granted a license to crenellate his manor house in 1201 in this area. It's very difficult to say where this licence related to however. The castle site to the East is mostly 14th century, and it's almost impossible to guess the form that any buildings may have taken within the confines of the moated site shown above. There is a distinct lack of any excavation reports, or specific history related to this site.